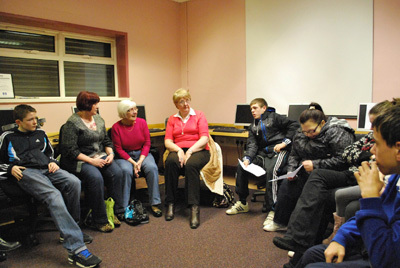 The first Sounds of the City workshop at Dee Street Community Centre took place on 22nd February with a group of local teenagers, older residents, community workers, the MAC’s education officer, and team from SARC. After the group arrived and introductions were made, we sat down to discuss expectations for the project and gain a sense of the community living around Dee Street and their everyday lives. A list of questions previously made by younger members of the group was then directed towards older members of the community, covering many facets of life in the area from personal experiences of working and social life, to larger issues such as changing divisions of communities within Belfast. These questions were then reversed and directed towards the younger generation, giving a sense of how life has changed. In the past the majority of those living around Dee Street were employed in the Shipyards and now vacant Rope-Works. Horns sounding for workers and the clamor of men clad with steel-capped boots returning from the shipyard were two of the most identifiable sonic features that have since vanished. These industrial sounds have been replaced with traffic and the presence of planes roaring overhead. Music and transmitted sound in the community have also changed. In the past, many traded long-playing records and the lack of television meant families would gather around radios, while now many of the younger generation listen to music on personal players, or play their favorite songs from mobile phones while walking with friends. One consistent feature has been the local swimming pool and baths, having remained the same both sonically and architecturally, providing the group with a place of interest to begin looking at. Our session concluded giving those within the community a sense of what life there is like for members of different generations, and those from outside an insight into Dee Street, how it has changed and what shared experiences remain.